Morabs are used very successfully for driving, dressage, halter, huntseat, pleasure, jumping, eventing, saddleseat , western pleasure, cutting, reining, working ranch, endurance, competitive trail, show trail, gymkhana, 4-H, demonstrations, horse fairs, parades, lessons, pleasure riding and therapeutic riding. Today’s well-bred Morabs combine Morgan strength and depth with Arabian refinement and sensitivity. Thanks to these parents, the Morab has a naturally superior pulmonary and cardiovascular system. Morabs possess a shorter back than other breeds, one backbone less as does the Arabian. This shorter back, combined with the longer croup of the Morgan, endows the Morab with great strength and smooth gait. This enables Morabs to excel in competitive and endurance riding. These traits also give the Morab, working off its powerful hindquarters, a natural athletic ability that makes it well-suited for the high performance demands of dressage, jumping and cutting horses. The mature Morab’s hooves and legs hold up well to excessive stress, since the Morgan contributes wonderful formation of bone and a medium-length pastern, and the Arabian parent adds the broad hard hoof and lower heel. This accounts for the almost non-existent foot and leg problems of the Morab breed. Many breeders report that their Morabs are never shod and require minimum hoof trimming. The Morab’s head may be straight to slightly dished with a big powerful jaw in contrast to a small muzzle with large, bold nostrils. 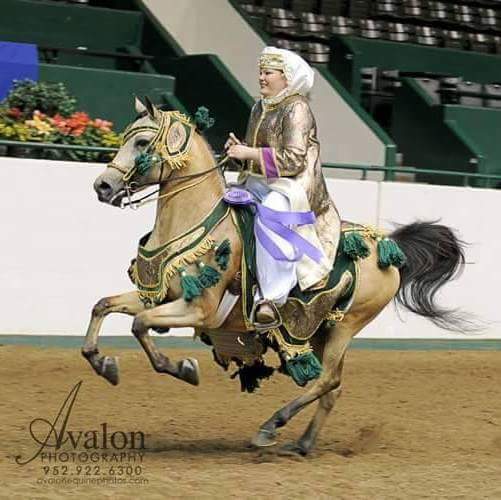 The refined, sculpted beauty of the Arabian, joined with the Morgan’s dramatic natural style and stamina, creates an elegantly powerful horse for use in the show ring, as a working horse, or on the trail. Indeed, most Morabs comfortable switch back and forth in all of these activities. The Morab body should be compact, of medium length, well muscled, smooth and stylish. A wide forehead sets off the Morab’s large, dark and expressive eyes. 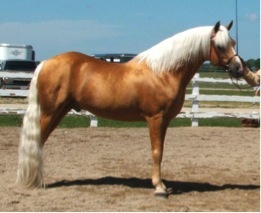 The Morgan horse adds a thick, luxuriant mane and tail to the Morab, which balances out its muscular build. Despite all the other highly prized traits of the Morab horse, most Morab owners and breeders will cite the Morab’s intelligent and affectionate nature as its most valued quality. Many claim their Morabs cannot be beat in temperament, intelligence, and willing attitude. 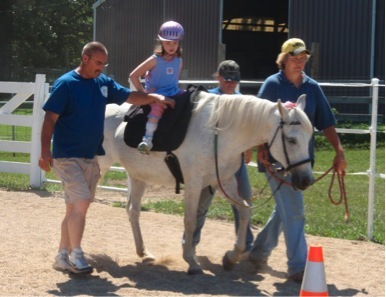 This is why mature Morabs are so popular as mounts for children and amateur riders. Since the 1800’s horse breeders have been interested in combining two favorite breeds, the Morgan and Arabian, to produce the marvelous Morab horse. History’s first recorded Morab was the famous trotting horse, Goldust, who was unbeaten as a harness racer, and won a famous race in 1861 against Ironduke for $10,000. In 1920, William Randolph Hearst was credited with coining the name “Morab,” for the athletic Arabian-Morgan horses he bred to work the mountainous terrain of the Hearst Ranch. In 1973, Ilene Miller founded the first Morab Horse Registry in Clovis, California, and she registered over 500 horses before her untimely death a few years later. IMBA (International Morab Breeders’ Association) launched the first fully computerized Morab registry in 1992. IMBA continues to promote the Morab breed throughout the USA and in other countries.